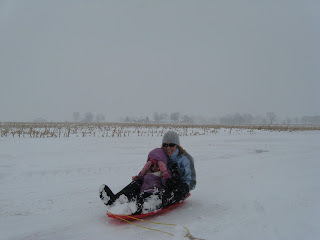 Keeping Up With the Kapenga's: Snowy Day Fun! Dave recently sold his snowmobile and bought a newer one. 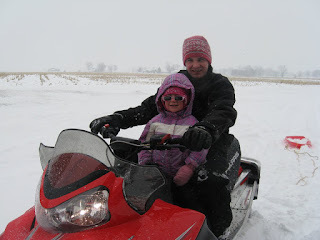 He was really excited about all the recent snow and was even more excited to see if Jenna was going to enjoy riding it with him. Saturday was freezing cold and out in the open at his parents house the wind made it feel much colder than here in town! First he pulled Jenna and I in the sled behind the snowmobile. We had to wear sunglasses so we were blinded by the snow coming down, maybe we need to invest in some goggles. Then Jenna actually asked to ride on the snowmobile instead of in the sled. She LOVED it and you could hear her giggling and telling Dave to go faster. He was very happy that she liked it so much. Any snow adventure should end with a cup of hot chocolate! 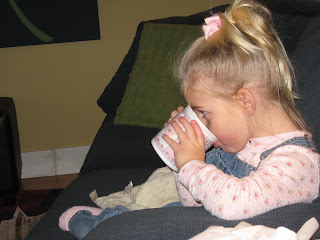 Here is little miss Jenna enjoying her cup of cocoa while snuggling on the couch.